-- The XPENG G3 presents superior configurations in its debut at the Guangzhou International Automobile Exhibition 2018 - Price range of RMB200,000 - 280,000 per unit before subsidies offers attractive value to customers - First car manufacturer in China to operate a network of Super Charging Stations across major cities - Direct sales & service platform to redefine EV user experience. GUANGZHOU, China, Nov. 16, 2018 /PRNewswire/ -- XPENG Motors, a frontrunner in China's smart electric vehicle market, is to launch its commercial model, the XPENG G3, on December 12, 2018. The pure electric 5-seat compact SUV presents an impressive combination of intelligent features and configurations in its debut at the Guangzhou International Automobile Exhibition 2018, China's A-class auto show. Tailored for the vast and fast growing tech-savvy young consumer base in China, the XPENG G3 is priced at a range between RMB200,000 to RMB280,000 before government subsidies, offering customers attractive value. He Xiaopeng, Chairman and CEO of XPENG Motors, elaborated the company's prudent, user-centric approach to quality control, safety standards and the pace of delivery. "We made a deliberate decision to go through an extensively stringent testing and vigorous validation process to ensure the XPENG G3 offers its best to our customers," said He. "It's a challenge for any new EV manufacturer to ramp up production and meet delivery targets. Quality has not been compromised in our pursuit of speed. It is not a race. There's no shortcut. It's about gaining consumer confidence in our products and services and building a solid reputation for the EV sector in China," he added. XPENG Motors was the first among new EV manufacturers in China to receive the China Compulsory Certification by the Ministry of Industry and Information Technology in July 2017. About 1,000 units have been produced for temperature, altitude and CNCAP crash tests and validation, accumulating a total of 10,000,000 kilometers or 100,000 hours of road testing. XPENG Motors is expanding its end-to-end direct sales and service platform, which meets the major user demands throughout an EV's lifecycle from online and offline sales, post-sales services, charging, auto financing to insurance. 15 direct sales and service stores in Beijing, Shanghai, Guangzhou, Shenzhen and Hangzhou to open before the Chinese New Year in Feb.2019. 70 stores across nearly 30 cities expected to open in 2019 to service the cities where XPENG Motors vehicles will be sold. The first new EV manufacturer to open a T-Mall shop with approximately 400,000 online visitors at the recent "11.11 Singles Day". It is the first auto manufacturer to operate a network of Super Charging Stations in China, having invested a significant amount of capital and resources. 100 Super Charging Stations in more than 10 tier-1 and tier-2 cities will be contracted by the end of 2018. 30 Super Charging Stations will be in full operation in Beijing, Shanghai, Guangzhou, Shenzhen and Huangzhou before the Chinese New Year in Feb 2019. 200 Super Charging Stations across 30 cities to start operation in 2019. 1,000 Super Charging Stations to be contracted over the next three years. Users have access to 100,000 third-party charging piles located in major cities adjacent to main roads via XPENG Motors' App. Through XPENG Motors' auto finance and leasing subsidiary and its partnerships with financial institutions such as Bank of China, China Merchant Bank, Pacific Insurance and AXA Taiping Insurance, XPENG Motors will provide tailored and effective financing and insurance solutions to customers. "We have a very supportive shareholder and investor base and a long term strategy to navigate through the challenges in this fast evolving and growing market. Our unique DNA and a prudent, nimble and innovative culture enable us to stay at the forefront of the market," He said at the auto exhibition. 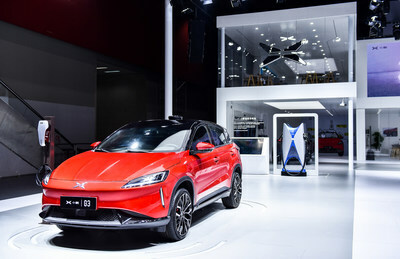 XPENG Motors is a new smart electric vehicle manufacturer that strives to develop and produce high-performance, intelligent and connected automobiles with a vision to redefine driving experience. Headquartered in Guangzhou, the company has R&D and marketing divisions in Beijing, Shanghai, Silicon Valley (United States) and Zhaoqing (Guangdong Province) where its own new manufacturing base, the Intelligent Science and Technology Park, is located. The facility is expected to be completed by the end of 2019. Currently, it partners with Haima Automobile to jointly manufacture at the Intelligent Production Base in Zhengzhou, China. XPENG Motors was established in 2014 with joint investments from a group of leading Chinese entrepreneurs and executives including He Xiaopeng, co-founder of the mobile Internet company UCWeb and former President of the mobile business division of the Alibaba Group, Li Xueling, founder of video-based social network YY Inc., Wu Xiaoguang, a high-ranking management executive at Tencent Holdings Limited and Gao Xiang, Founding Partner of Banyan Capital. The company was also co-founded by Xia Heng, former Chief of New Energy Control System R&D at the GAC Group, and He Tao, Chief of the Intelligent Car and Unmanned Driving Division at GAC.